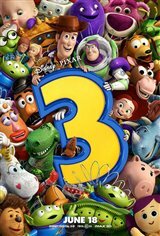 As Andy prepares to depart for college, Buzz, Woody and the rest of his loyal toys are troubled about their uncertain future. After being accidentally thrown away, the toys land in a room full of untamed tots who can't wait to get their sticky little fingers on these "new" toys. It's pandemonium as they try to stay together, ensuring "no toy gets left behind." Meanwhile, Barbie comes face to plastic face with Ken (yes, that Ken).